Anyone who knows me will tell you I struggle with organization and because of that, I have always envied those people who are really good at it. Yeah, you know who you are. They are organized and well put together in every area of life and able to discuss their ten page, mentally stored to-do list without even breaking a sweat. Of course, I am way on the other end of the spectrum. My mind is usually a fractured mess of ideas and tiny fragments of who knows what, which in the past, were either forgotten or lost in the abyss of gray matter. Such is life. I was browsing through Clickin’ Moms some time ago and came across a post from Amanda at Finn Rose Photography, about organizing with Microsoft OneNote. And let me tell you…it has changed my life for the better. For business, I use it to organize my client workflow, client email templates, shooting locations, track my job profit, organize ideas, bits from the web, links, addresses, marketing ideas, to-do’s and so on. You can even add audio, video and screen clips. 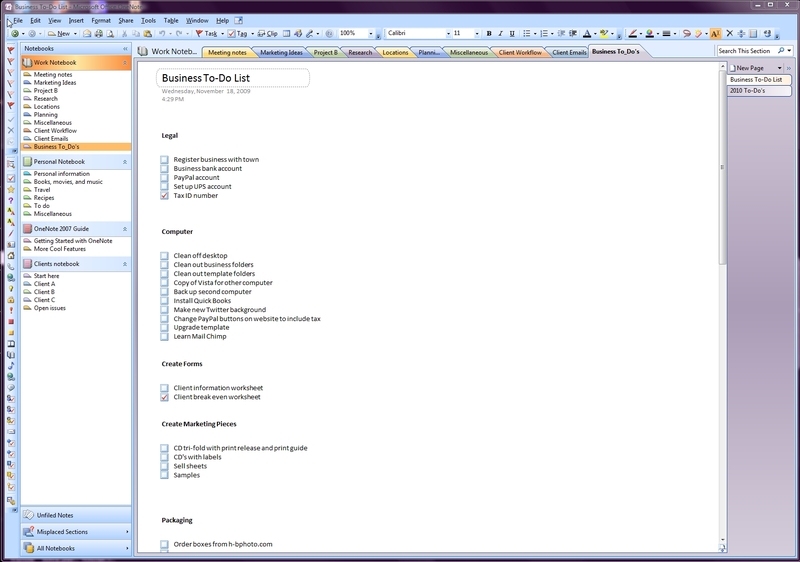 OneNote organizes all your information in a digital workbook format, with tabs that make it easy to find everything. And if that’s not enough, you can locate your information with tags. For personal stuff, I use it to create shopping lists, keep track of medical information, recipes and so on. It even comes with built in templates, to help you get started. However, I like making my own templates that I can reuse for each occasion. I have only just begun to realize the potential of OneNote. So here’s to better organization in 2010! I’m home after a really fun weekend, which I really needed. I’m going to try to summarize, so bear with my rambling. The trip was really wonderful and I met some new friends. We had a really good time in-between classes and on Friday night, took the Hotel shuttle into downtown Stamford to have dinner at California Pizza Kitchen. As it turned out, not one of us wanted to $17.00 for a quesadilla from the hotel. And I can’t imagine why? Stamford is just a short ride on the train into Manhattan, but we were all too tired to make the trip, so we decided to stay in town. However, I have made a mental note to myself to stay in Stamford next time I wanted to go into the city. Aside from the room service and any other amenity you may need, the Stamford Hilton’s rooms were quite reasonable. Just don’t get hungry or thirsty while you are there. Dinner out was a lot of fun and there was a lot a laughing, which did my spirit good. Laughter lightens the soul and mine sure needed some lightening after the past week. Classes were also good, but there was a lot of review for me. I knew that the conference was geared more towards the beginning photographer; however, there is always more to learn and I was right. The best classes were taught by Candace Stringham, Matt Adcock, from Del Sol Photography, (with his beautiful wife assisting, Sol Tamargo) and Cheryl Muhr, who by the way, is a total trip and full of energy. I knew the trip was a success by what I learned. I had a lot of technique questions answered, especially in Candace’s class on Writing with Light. There were a few things I about the weekend that would have changed. Except for Candace’s class, there was NO opportunity to use our cameras during class. I would have liked the workshop to be more like a workshop and not a bunch of lectures. People see by doing and it would have been really cool to have fewer photographers there, with longer time periods to go outside and practice what we learned with some guidance. Some of the classes seemed more about the photographer and their portfolio, than about technique. I also would have changed the fact that I had my windshield cracked on the way to the event by a rock that a dump truck kicked up, but I was blessed that it is a very small crack and it didn’t cause more damage, or an accident. I also would change the fact that every one of my photos from the weekend were erased accidentally. I have no idea how, but they are gone. The photos I posted for Thursday and Friday were all taken on my way out of the hotel, wearing a frown because my photos were gone. All things aside, I had fun and relaxation. I was blessed by the whole trip and would definitely do it again, if given the chance. The photos of the front desk area below, didn’t really come out to good, but I’m posting the shots anyway. The lights would constantly change color and it was really cool to look at. Sort of a had to be there moment. My weekend photo buddies: Louise, JoAnne, Maureen and Deenie.